(Q24N) The regime of Daniel Ortega in Nicaragua took the final step on its way toward dictatorship when it removed 28 opposition congressmen from office on July 29. Moreover, the country’s electoral body rubber-stamped Ortega’s plan to run for what could be his fourth presidency and third consecutive term. This time, his running mate is no less than his wife, the controversial Rosario Murillo. This institutional breach shows that Ortega is no longer concerned with keeping up appearances and is willing to stay in power at any cost. The parliamentary coup and nepotism just goes to show that he refuses to participate in open, transparent elections, in which the ruling Sandinista National Liberation Front (FSLN) could actually lose to the opposition. Reactions to these latest events swiftly appeared both at home and abroad, condemning them as a coup and a violation of the Nicaraguan people’s sovereignty, the Constitution, and international law that underlies the United Nations and the Organization of the American States (OAS). However, the Nicaraguan regime cares little about multilateral bodies. The main business chamber of Nicaragua, the Superior Council of Private Enterprise (COSEP), which has turned a blind eye to President Ortega’s abuses while enjoying privileges for a decade, is now openly demanding respect for the Constitution. COSEP is asking Daniel Ortega to prevent “the concentration of power at the expense of democracy,” arguing that the parliamentary coup “weakens representative democracy, political pluralism, and the division of power.” The American Chamber of Commerce of Nicaragua has issued a similar statement. Abroad, criticism and demands are also multiplying. In addition to the harsh pronouncements of the US government and several others, 25 Latin American former presidents have asked the OAS Permanent Council and the European Union (EU) to maintain a “critical vigilance” towards the “serious disruptions to the democratic and constitutional order” — in Nicaragua as well as in Venezuela. 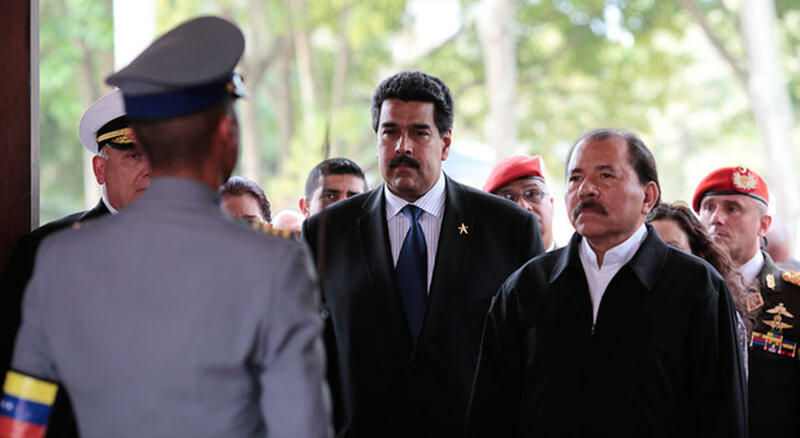 The similarities between Daniel Ortega and his main ally in Latin America, Venezuelan President Nicolás Maduro, have triggered alarms across the region. The threats that Maduro’s regime has made in recent months against the Venezuelan opposition have materialized in Nicaragua as well. In Venezuela, President Maduro has used the Supreme Court to override 18 of the 19 laws that Congress — dominated by the opposition — has passed in the last six months. Like the Nicaraguan regime, Venezuela’s not only counts on a top court packed with party loyalists. Maduro has unashamedly announced that he will stop funding Congress, and his administration has requested subservient electoral authorities to withdraw the license of opposition alliance Democratic Unity Roundtable (MUD). As Chilean analyst Fernando Mires has noted, it seems that a new trend is taking root in many Latin American countries — and even in some European ones — on behalf of a false direct democracy: the power of congressmen is being transferred to an increasingly authoritarian executive branch. It’s already happening in Putin’s Russia, Erdogan’s Turkey, and in Victor Orban’s Hungary, where the legislature has become little more than an ornament for autocratic presidents who feel destined to “save” their people. So now the question is: How can we stop this trend? What can we do so that the dictators of Nicaragua and Venezuela allow citizens to decide the future of their countries through free and fair elections? At this point, the task seems impossible without massive protests in the streets, aided by greater international pressure. But mere electoral observers missions to ensure transparency in the upcoming elections are not enough. It is time to implement strong, realistic, multilateral, economic and diplomatic sanctions to these regimes. And it is up to neighbouring countries to take the lead. There is no other democratic and peaceful solution.